We offer a comprehensive range of MDPE fittings. Please contact a member of our sales team to discuss your requirements. MDPE 25MM COUPLINGActs as a compression joint; plastic grib will grab on to the pipe and has a rubbe..
MDPE 25MM ELBOWHigh quality compression fitting for MDPE pipe. Suitable for use below ground on cold..
MDPE 25MM END PLUGMDPE 25mm End PlugMedium density polyethyleneCompression fittingUsed to connect tw..
MDPE 25MM STOPTAP25mm x 25mm compression stop tap for stopping water flow through 25mm HDPE and MDPE..
MDPE 25MM TEE25 x 25 x 25mm. High quality compression fitting for MDPE pipe. Suitable for use below ..
MDPE 32MM COUPLINGType: Coupling Connection: Compression Pipe Size: 32mm&nbs..
MDPE 32MM ELBOWHigh quality compression fitting for MDPE pipe. 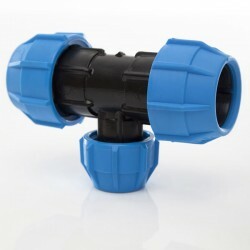 Suitable for use below ground on cold..
MDPE 32MM END PLUGMDPE 32mm End PlugMedium density polyethyleneCompression fittingUsed to connect tw..
MDPE 32MM STOPTAP32mm x 32mm compression stop tap for stopping water flow through 32mm HDPE and MDPE..
MDPE 32MM TEEFully demountable and reusable system. High impact resistant body and nut absorbs therm..